To a fantastic season, a phenomenal ending 7-0 in Hoopfest, coming out CHAMPIONS!!!! We did it for you Hunter! We ALWAYS played with passion, integrity, respect, intensity, and with genuine love for our teammates and for the game. 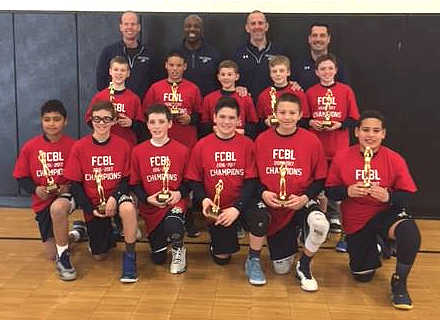 The Milford Knights Blue 6th Grade travel team captured its 4th Championship of 2016-17 with a 49-32 victory over Wilton White in the FCBL Championship Game held at Ridgefield High School. The Knights dialed long distance early and often in the first half thanks to 3-pointer’s by Ethan Long and Brendan Buchner. John Neider added a hoop and 2 free throws to give the Knights a 12-6 lead after 1 quarter. Long and Buchner were at it again in the 2nd quarter as both hit 3’s to extend the lead to 22-14 at the half. Zach Worzel opened the Knights scoring in the 3rd quarter with an offensive put-back and Long added 9 of his game-high 19 points in the quarter to break the game open and give the Knights a 41-22 advantage after 3 quarters. 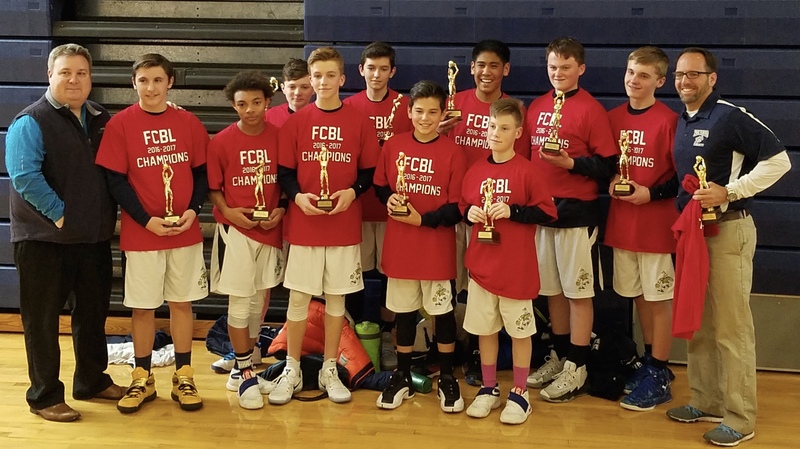 In the 4th quarter, Nolan McKenna-Hansen added 4 points, Jack Aliberti 2, and John Neider added 2 more of his 14 points in giving the Knights their second FCBL Championship in as many years. The Knights title defense started with an opening round road win over St. Mary’s of Ridgefield. The Knights got off to a hot start in the first half sparked by a strong defensive effort by Riley Jordan and Aidan Ryan and rode the outside shooting of Buchner, Long and Cole Pleiman as they jumped out to a 31-8 lead at the half and cruised to a 49-33 win. 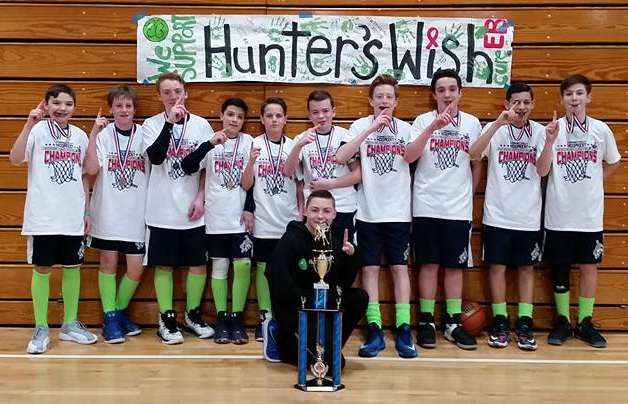 Brendan Buchner led the way with 18, John Neider 12, Ethan Long 10 and Cole Pleiman 5 points. 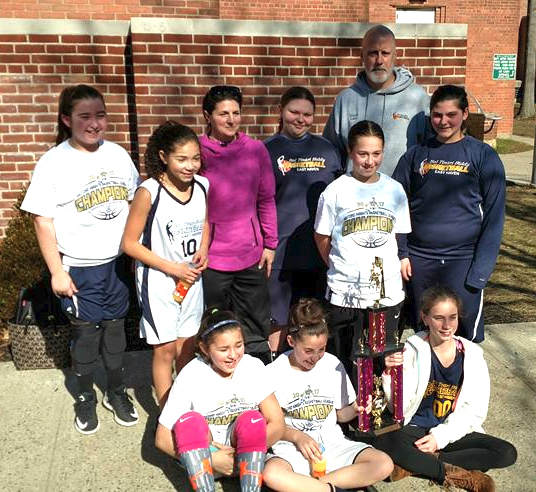 The Knights took on Greenwich Select in the tournament’s second round match up held at the Westport YMCA. The Knights hot outside shooting continued, as Long and Buchner each buried first half 3’s in giving the Knights a 20-16 lead at the half. Baskets by Ethan Long, John Neider and Zach Worzel were key as the Knights used a decisive 8-0 run in the 3rd quarter to pull away from Greenwich. Ethan Long led the Knights with 16 points, Brendan Buchner 7, and Nolan McKenna-Hansen 5 points as the Knights held on for a 37-26 victory. In the tournament semifinals, the Knights took on CSA-Danbury in Ridgefield. Brendan Buchner opened the Knights scoring with a deep 3, Nolan McKenna-Hansen and offensive put back and John Neider slashed his way to 6 first quarter points in giving the Knights an 11-6 lead after 1 quarter. The Knights erupted with 18-2nd quarter points led by Ethan Long (6), Jeanero King (4) and another Buchner 3 ball to extend the Knights lead to 29-10 at the half. Cole Pleiman, Riley Jordan and Jacob Cupole led the Knights the rest of the way as they cruised to a 44-23 final. Top scorers for the Knights were Buchner and Neider each with 11, Ethan Long 8 and Jeanero King 6. The 46-6 Knights next play in a rematch of last year’s finals of the Sal Tinari’s Basketball Tournament in East Haven as they take on Bristol Blue on Thursday night. On Saturday, the Knights will compete in the finals of the St. Mark’s tournament against tournament host St. Mark’s of Stratford. 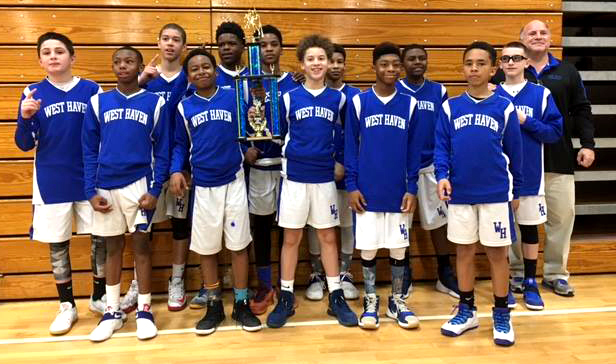 The 8th Grade Milford Knights basketball team won the Fairfield County Basketball League C Division Tournament championship by defeating REBA (Redding/Easton/Brookfield Association) at Weston High School on March 11. Pictured are assistant coach Chad Bedell; Michael Fanara, Naheim Washington, Robbie Wainman, Jake Ivan-Pal, Jakub Dabrowski, Aidan Berchem, Juanito Briones, Nick Bedell, Weston Tracy, Evan Tracy and head coach Jon Berchem. 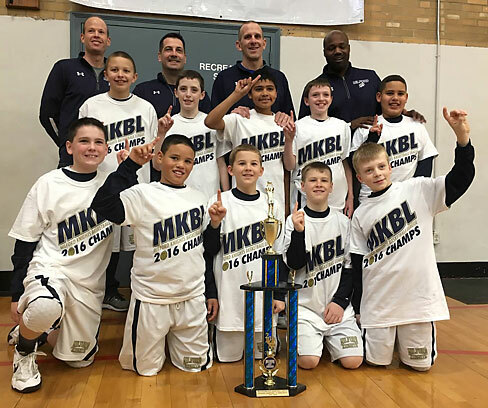 The Milford Knights Blue 6th grade travel boys basketball team captured the MKBL Sunday League title with a 32-15 win over the Orange Wolverines on Saturday morning at Jonathan Law. The defending champion Knights got early baskets from Nolan McKenna-Hansen and Jon Neider to take a 4-0 lead. Ethan Long added two baskets to give the Knights an 8-2 lead after one quarter. A Riley Jordan driving lay-up and Jeanero King hoop in traffic extended the lead to 14-4 at the half. The Knights stifling zone defense kept the Wolverines off-balance for most of the third quarter, where the Knights used a decisive 9-1 run to take a commanding 23-5 lead heading into the fourth quarter. A Zach Worzel elbow jumper got the Knights started in the fourth quarter and Long scored seven of his game-high 19 points to lead the Knights to its second tournament championship of the season. The top-seeded Knights championship run started with an opening round win over East Haven 38-21. Jack Aliberti and Aidan Ryan sparked the Knights defensive effort. Offensively, the Knights were led by Nolan McKenna-Hansen (12), Brendan Buchner (8) and Riley Jordan (6). In the semifinals, the Knights took on a tough North Haven team who handed the Knights a loss earlier in the season. The Knights jumped out to a 23-13 halftime lead highlighted by a Jacob Cupole corner jumper off a nice feed from Cole Pleiman. Ethan Long led the Knights with 12 points, followed by Nolan McKenna-Hansen (11) and John Neider (6). The Knights (35-6) will next take the floor on Wednesday night in the first round of the annual St. Mark’s Tournament in Stratford. On Thursday night, the Knights will start the defense of another of their 2015-16 titles as they take on St. Mary’s of Ridgefield in the first round of the Fairfield County Basketball League Tournament. Good Luck to those moving on to the State Finals. 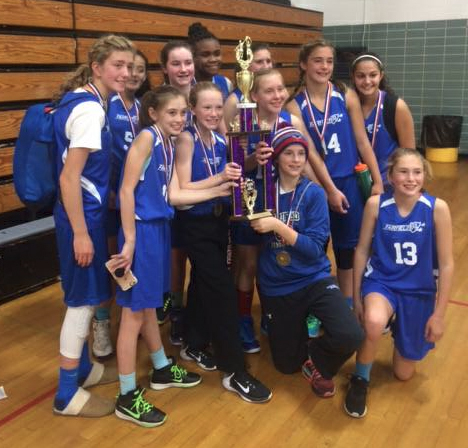 5th Gr Girls Knights win Holiday title in OT! 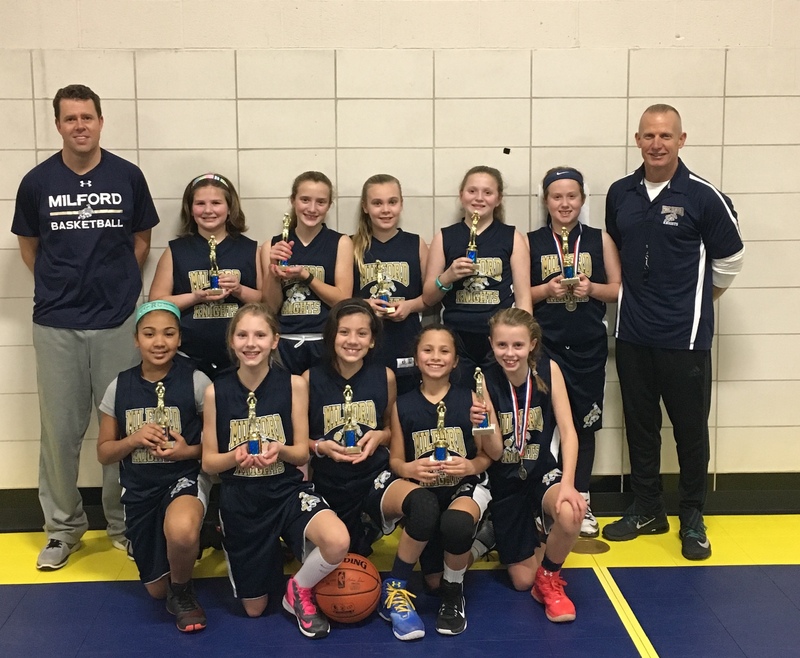 The Milford Knights 5th grade girls travel basketball team defeated Holy Infant in a thrilling 26-24 overtime game to take home the CT Holiday Basketball Tournament played at InSports in Trumbull over the holiday break. The Milford Knights are now 15-4 on the season. Erin Donegan, Faith Doyle and Abby Savoie were named to the all-tourney team. 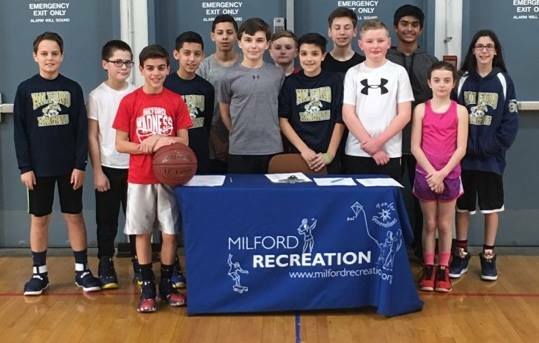 The Milford Knights Travel Basketball Program had great success in the CT Holiday Tournament, with the 4th grade boys, 5th grade boys, 5th grade girls and 6th grade boys all taking home championships. PHOTO: Team members (front row) are: Tiffany Rosado, Taylor LaFountain, Bella Eyler, Ava Deitelbaum and Faith Doyle; (second row) coach Trevor Doyle, Lily Baird, Abby Savoie, Katie McTigue, Maggie Wetmore, Erin Donegan and coach Mike Donegan. 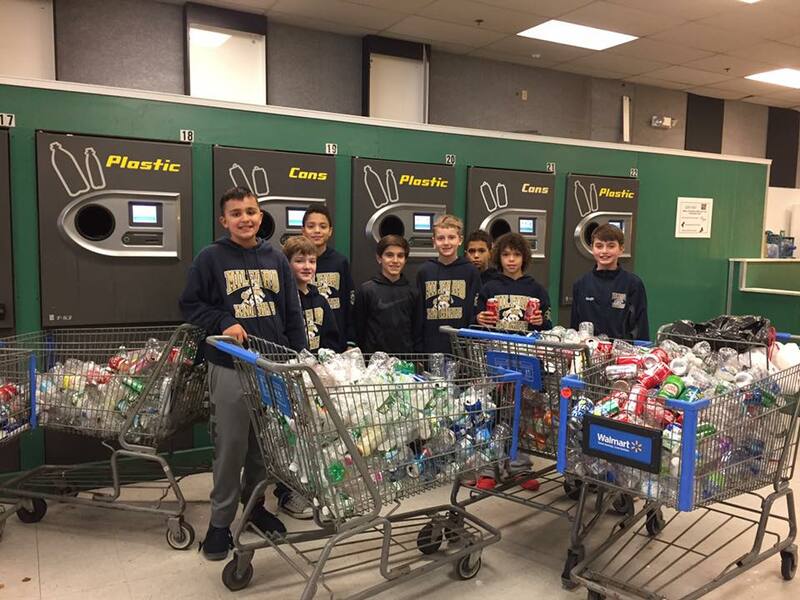 Milford Knights 5th grade blue returning bottles and cans to raise money for Danni!! 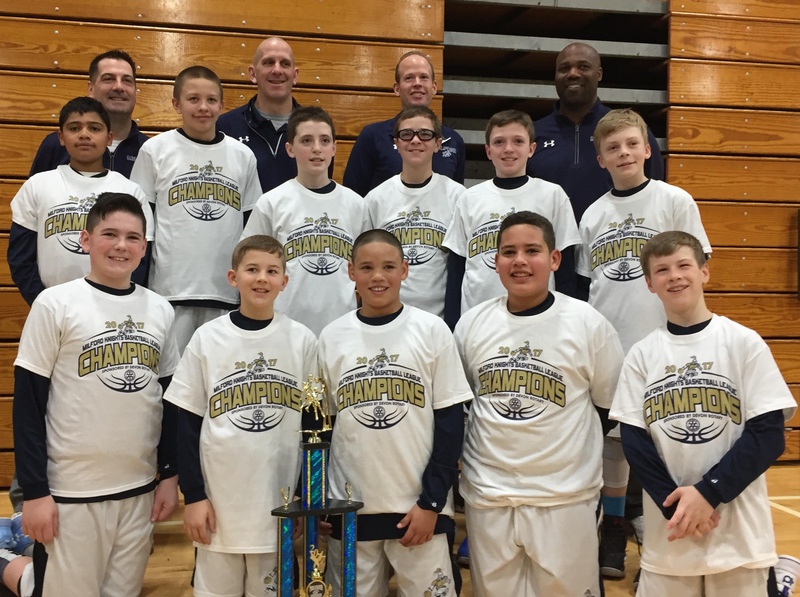 The Milford Knights Blue 6th grade boys basketball travel team captured its second tournament championship of the season by taking down Trumbull Black, 42-17, in the finals of the annual Insports Holiday Basketball Tournament Saturday in Trumbull. Suffocating defense and outside shooting paved the way for Milford in the first quarter. John Neider led the way seven points, followed by Ethan Long (5 points) and Brendan Buchner (3 points). In the second quarter, Nolan McKenna-Hansen added four points in the paint for the Knights and Aidan Ryan and Jacob Cupole sparked the defense in lifting the Knights to a 21-3 halftime lead. The stifling defense and hot shooting continued in the second half for the Knights, with Jeanero King and Riley Jordan each adding four points to help the Knights to championship. The Knights opened the tournament by facing Torrington. The Knights jumped out to a 25-6 halftime lead and cruised to a 39-16 victory. Offensively, the Knights were led by Neider (10 points), Long (7) with Buchner, Jordan, Zach Worzel and McKenna-Hansen chipping in with four points each. In the tournament second round, the Knights took on East Haven. Holding on to a 20-16 advantage at halftime, the Knights used an explosive third quarter to pull away by outscoring East Haven 16-4 in the quarter. Neider led the way with eight of his team-high 14 points. Buchner added six points and Jordan, Worzel, King, Long and McKenna-Hansen each finishing with four points on their way to a 46-27 win. In the tournament semifinals, the Knights took on the undefeated Bridgeport Chargers. The Knights got on the board quickly in the first quarter on baskets by Jack Aliberti and Neider and free throws by Long, Worzel and Neider to take a 9-6 lead. Buchner’s two driving layups, McKenna-Hansen’s put back and Cole Pleiman’s jumper from just inside the arc gave the Knights a 17-9 halftime lead. Holding on to a 20-16 lead after the third quarter, the Knights used their free throw shooting to put the game out of reach. In the decisive fourth quarter, Buchner sank six clutch free throws, Neider four and Pleiman one to move the Knights into the finals. The Knights placed three members on the all-tourney team in Neider, Buchner and Long with Neider earning tourney Most Outstanding Player Award. The 16-4 Knights play next on Saturday, Jan. 7, in an FCBL match-up against East Haven, followed by MKBL match-ups on Sunday against rival Orange Wolverines and Guilford Travel. its first tournament championship of the season! 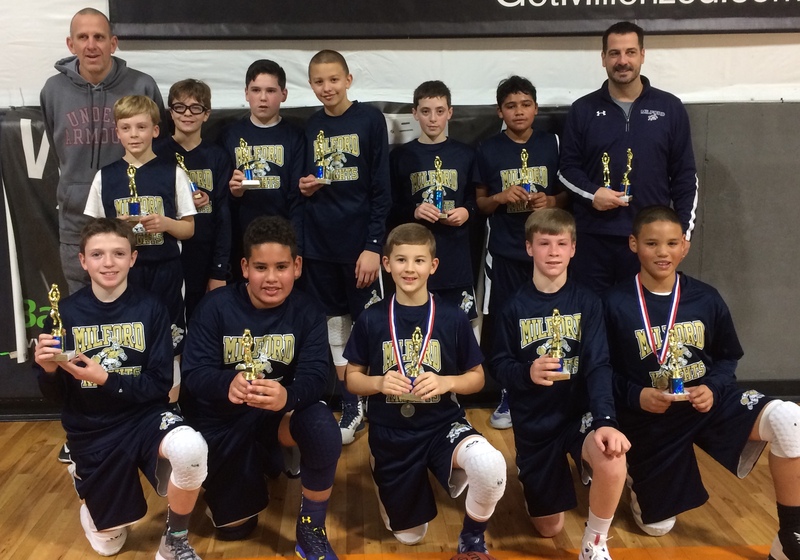 The Milford Knights Blue 6th Grade travel team captured its first tournament championship of the 2016-2017 season by taking down the host team from St. James School 40-25 in the finals of the 35th annual St. James Basketball Tournament. The Knights run to the championship started with an opening round win over the Milford Knights White 5th grade team 36-11. Offensively, the Knights were led by John Neider (14), Brendan Buchner (12) and Jack Aliberti (4). In the tournament 2nd round, the Knights took on the host St. James Hawks before a capacity crowd in Stratford. Here, the Knights jumped out to a 13-0 1st quarter lead highlighted by a Jeanero King baseline jumper and Jacob Cupole's defense. Zach Worzel led the Knights with 10 points, followed by John Neider (9) and Ethan Long (6). In the winners bracket final, the Knights took on St. Mark's of Stratford. Nolan Mckenna-Hansen, Aidan Ryan and Brendan Buchner led a balanced first half scoring attack in giving the Knights a 15-8 halftime lead. In the decisive the 3rd quarter, Cole Pleiman chipped in with 5 of his team-high 12 points and the Knights fought off a furious St. Mark's 4th quarter comeback and held on for a 38-36 victory. In the tournament finals, the Knights once again took on St. James. After leading 15-11 at halftime, the Knights secured the championship with some stingy defense led by Riley Jordan and offensively led by John Neider (12), Brendan Buchner (8) and Ethan Long (7) on their way to the 40-25 victory. 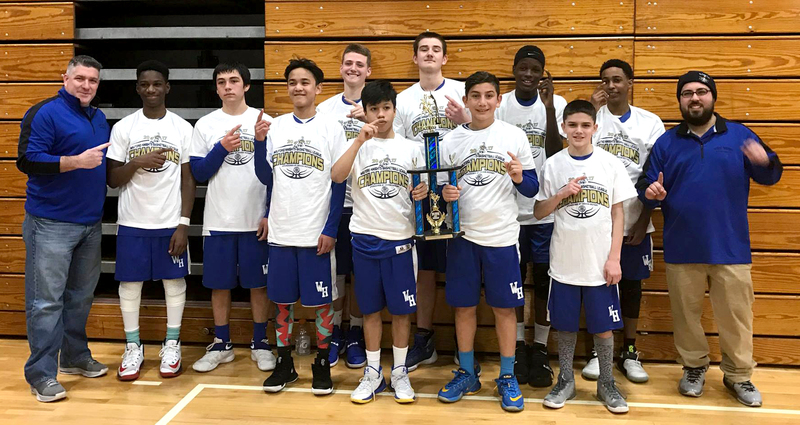 This marks the Knights 4th tournament championship in their brief 13-month history and will compete in the upcoming Insports Holiday Tournament in Trumbull. 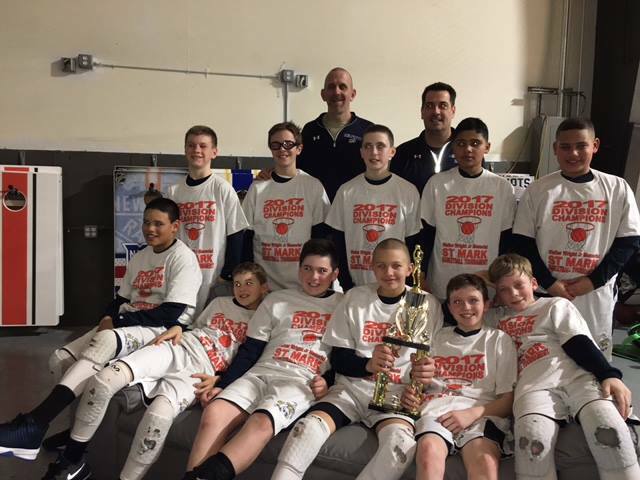 The Milford Knights Blue Travel 5th grade basketball team capped off the inaugural Milford Knights Travel League season by topping the Orange Wolverines in the tournament championship game. The regular season champion and top-seeded Knights limited the second-seeded Wolverines to four first-half points, and held off a furious third quarter Orange rally, before cruising to a 26-15 victory. John Neider got the Knights off to a fast start and scored five of his game-high 10 points in the first quarter. A basket by Ethan Long and a pair of Riley Jordan free throws gave the Knights a 9-2 lead after the first quarter. In the second quarter, a Jack Aliberti elbow jumper, Zach Worzel lay-up and Neider free throw gave the Knights a 14-4 lead at the half. Orange came out fighting in the third quarter with a couple of 3-point baskets to narrow the gap. Baskets by Neider and Jordan pushed the Knight’s lead back up to eight to end the third quarter at 18-10. In the decisive fourth quarter, the Knights closed out the Wolverines with two Ethan Long lay ups, a Brendan Buchner jump shot and two more Neider free throws. 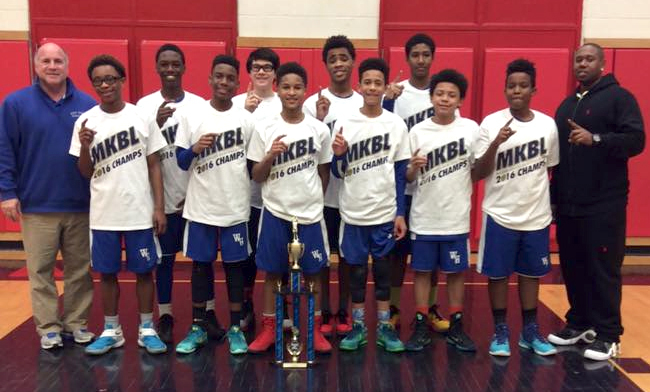 The Milford Knights won the Travel League tournament title. Team Members (front row) are: Zach Worzel, Ethan Long, Brendan Buchner, Riley Jordan and Cole Pleimann; (second row) Nolan McKenna-Hansen, John Neider, Jacob Cupole, Jack Aliberti and Jeanerro King; (third row) coaches Chris Buchner, Scott Worzel, Ron Hansen and Kevin Long. 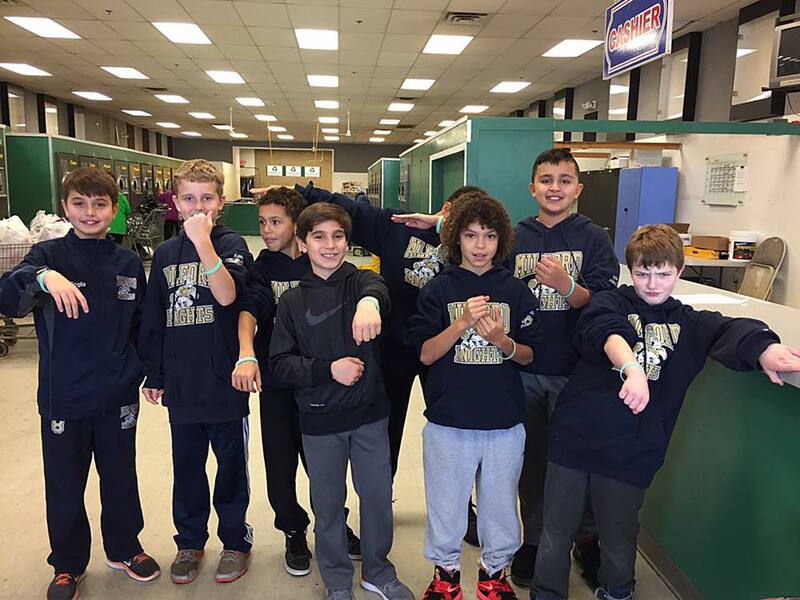 Basketball 4th grade team held a Toys for Tots community give-back night last night. They visited the firehouse on New Haven Ave after their practice. The kids all brought unwrapped toys to the event and donated them. The firefighters themselves could not have been more open and welcoming. The kids had full access to several firetrucks and had an absolute blast!!!! The event was both fun and educational and the team proudly represented the Knights organization in an incredible manner. This great event was put together and coordinated by our asst coach Paul Goglia. Have a great holiday season. Go Knights!!! !